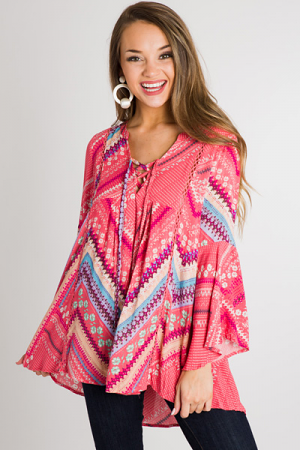 With it's vibrant hues + swing shape, this dress is sure to be the statement piece of your closet! It also features big bell sleeves, a V neck line, and a longer length in the back that allows this to be worn as a tunic or a dress. Fit is roomy. Model is wearing size small. Length measures approximately: S=33/35" M=34/36" L=35/37"